Help provide kitchenware to families in need with Recycle Pots And Pans at the Cleveland Zoo this Saturday, November 10th from 10AM-4PM for America Recycles Day. Recycle Pots and Pans, an Ohio non-profit organization, collects commonly used kitchen items for recycling and redistribution to families in need. Our immediate needs include pots, pans, plates, tableware, measuring cups, silverware and small kitchen appliances. Recycle Pots and Pans distributes through Ohio non-profits including the Domestic Violence Center- Cleveland, Safer Futures-Kent, Community Action Council-Ravenna and more. To date we have distributed over 35 kitchen sets and helped families prepare and enjoy meals at the family table. Help Recycle Pots And Pans help others by cleaning out your kitchen cabinets and do a quick, easy drive thru donation at the Cleveland Zoo this Saturday from 10-4. More information available at www.recyclepotsandpans.com, Facebook or by calling (330)715-4140. Recent article from Edible Cleveland. Here is a recent article about what were doing at the creamery and the farm. Heat oil or butter in a skillet over medium heat and add onions. Cook until onions are translucent, stirring occasionally. Add sausage, breaking up with the back of a spoon into very small pieces. When the sausage had just lost its pink color, add the apples. Cook, stirring occasionally, until the apples are crisp-tender. Stir in the honey and the goat cheese, stirring to thoroughly mix. Fill tart shells with mixture and serve warm. Optional Garnish: If you want to create a fancy garnish for these tartlets, you can finish them with fried sage leaves. Heat 1/3 cup olive oil in a large pan over medium heat. Test the oil temperature by placing one sage leaf in the oil – if it sizzles, the oil is ready. Drop 1/3 cup whole fresh sage leaves into the oil. Cook until the leaves are speckled and begin to turn very dark green. Scoop out the leaves and let them drain on a paper towel. Melt butter in a large saucepan or dutch oven over medium heat. Add leek, salt and pepper and cook, covered, until very soft, about 10 minutes, stirring occasionally. Add garlic and curry powder and cook for another minute. Add vegetable stock and pumpkin puree and mix well. Bring to a boil, cover and turn down the heat. Cook for 10 minutes. Remove soup from the heat and add goat cheese. Puree soup in a food processor, blender or with an immersion blender. You may need to puree the soup in batches. Make sure to vent the food processor or blender while processing. Return the soup to the pot. Adjust seasoning with salt and pepper if necessary. Optional Garnish: Thin additional goat cheese with milk until it is the consistency of whipped cream. Place a dollop of goat cheese in the center of each bowl before serving. Note: Do not boil the soup once the goat cheese has been added. You may make the soup a couple of days ahead of time, up to the point that the goat cheese is added. To finish soup, bring to a boil, then add goat cheese and continue with the recipe. Finished soup may be re-heated gently to desired temperature. 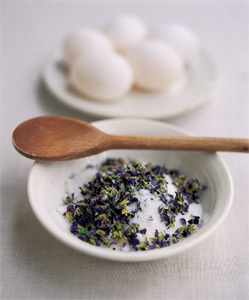 Mix softened goat cheese with lavender in small bowl and set aside. Chop dried cherries into small pieces and combine with honey, compress and set aside. Retrieve goat cheese/lavender mixture and roll cheese into two equal balls. Slightly flatten balls and place on top of each an equally divided amount of cherry/honey mixture. Add lavender sprigs for garnish. Chill if not serving immediately. Will keep for one week in refrigerator. This salad is a variation on the traditional Waldorf salad, but is much lighter with the sparkling tang of cranberries. Try to use local produce if you can, and make sure the apples are crisp and sweet. Good, local Red Delicious apples go very well in this salad, as do many other sweet varieties. Toast nuts by placing them on a baking sheet and heating in a 375-degree oven for 5 minutes. These cookies are based on a recipe for Italian ricotta cookies. They are cakey and light, and made without eggs. They are also quick to make and you can get the whole family involved. They are wonderful with chocolate, orange or lemon icing, and increase the citrus flavor by adding the zest of one orange or lemon to the batter. Use your imagination! Preheat the oven to 350 degrees. Mix all cookie ingredients together until the dough comes together into a ball. The dough will be sticky. Place teaspoon-sized balls on ungreased baking sheet, about 2 inches apart. Bake for about 12 minutes or until the bottoms are brown. Let cool for one minute on the baking sheet, and then remove to a rack to cool completely. In a small saucepan, combine the powdered sugar with enough orange juice to make a glaze to spread on the cookies (a couple of tablespoons or so). Stir over low heat until smooth and glossy, then spread over the cookies. Quickly top with sprinkles or colored sugar. In a large saucepan over high heat, bring water just to a boil. Remove from heat, stir in dried lavender flowers, and let steep for 20 minutes. After 20 minutes, strain the mixture into a deep kettle or pot, discarding the lavender flowers. Stir in lemon juice and pectin; continue stirring until the pectin is dissolved. Over high heat, bring the mixture to a boil; add sugar. When the jelly solution returns to a hard rolling boil, let it boil for 2-4 minutes (see below), stirring occasionally. Testing for "jell" or thickness: Keep a metal tablespoon sitting in a glass of ice water. Take the spoon and scoop up a half spoonful of the mix and let it cool to room temperature on the spoon. If it thickens up to the consistency you like, then you know the jelly is ready. If not, mix in a little more pectin (about 1 teaspoon to 1/2 of another package) and bring it to a boil again for 1 minute. 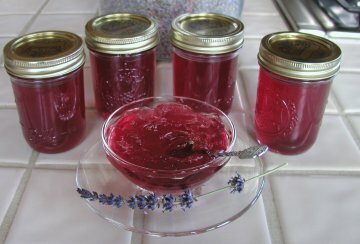 After boiling, transfer the jelly into hot sterilized jars. Fill them to within 1/4 inch of the top, wipe any spilled jam off the top, seat the lid and tighten the ring around them. Preheat the oven to 400 degrees Fahrenheit. Blend the dressing ingredients together until smooth. Mix the goat cheese with dill until smooth. Make balls of the cheese mixture using 2-3 teaspoons each. Mix the pecans and breadcrumbs in a shallow pan. Coat the cheese balls with the pecan breadcrumb mixture. Bake the cheese on a lightly oiled cookie sheet. Toss the arugula with your preferred amount of dressing. Place a baked goat cheese ball on top. Garnish with breadcrumbs and olives. Rinse the flowers and spin them very dry in a salad spinner or pillowcase. Place half of the sugar into a small shallow bowl with a flat bottom. Spread the violets over the sugar. Top with the remaining sugar and lightly crush the sugar into the violets using the base of a heavy drinking glass or a mortar and pestle. Cover the bowl with a clean, thin, dry dish towel until the flowers are completely dried out, which could be a couple of days depending on the humidity in your area. Sift through an open strainer. Bottle the sugar and the sugared flowers separately. Cap and store in a cool dark place. Peel the potatoes, grate them and put them in a bowl. Pick up a handful of potatoes and squeeze as much liquid as possible out of them, discarding the liquid. When you have squeezed all the potatoes, put them back in the bowl. Add the eggs, flour, salt, pepper and parsley and mix well. You can add the finely chopped onion if you want. Put a few tablespoons of oil in a large, heavy-bottomed frying pan and heat well over a medium-high flame. Put spoonfuls of the mixture into the oil and fry until the edges turn brown and crisp. Turn over and fry until golden brown. Place the cooked pancakes on a baking dish and keep in a warm oven until ready to serve with goat cheese. Put all the ingredients except the oranges into a large pan and simmer for 4-5 minutesRemove the lemon peel and cinnamon stick. Pour into a warmed punchbowl and add the orange slices. Serve with a ladle into warm glasses. Studies show that when kids eat meals with their families, they’re more likely to have nutritious diets, healthy body weights and do better in school. Thankfully, President Obama signed into law the Healthy, Hunger-Free Kids Act of 2010, providing funding to improve children’s access to healthy nutritious meals. Although this is landmark legislation, still more can be done. Our local food banks are doing a heroic job providing more food to those in need, but often these homes lack the tools used to prepare and enjoy the food- pots, pans, plates forks and knives. The organization, Pots and Pans, was created to address this need. The mission of Pots and Pans is to provide cooking tools to those in need through the recycling and re-distribution of commonly used kitchen items. The goal is to recycle and share tools needed for the easy preparation of meals enjoyed at the family table. We need you! Clean out your kitchen cabinets, shop garage sales, attend auctions and help us collect, recycle and re-use commonly used kitchen items. Are you an empty nester? Do you have elderly parents moving to smaller homes? Changes of life often identify a surplus of stuff that others can benefit from, so recycle it and donate your kitchen items to Pots and Pans. Help us keep the good stuff moving forward. Pots and Pans is a volunteer organization guided by community members dedicated to food and family. If you are interested in helping us grow through volunteering or to donate items or funds please contact us at (info@recyclepotsandpans.com). We will gladly pick up multiple items from homes and restaurants.